Assault | Pro Chem, Inc. ASSAULT is a fast-acting cleaner and degreaser that immediately removes stubborn, oily and greasy soils from a wide range of washable surfaces. It is an all-purpose cleaner/degreaser that rapidly penetrates and dissolves dirt, oil, grease, carbon, rubber marks, wax, soot and many other resilient soils. Free of fumes and has a natural sassafras aroma that makes it pleasant to use. Contains special rust inhibitors, making it safe for use on metal surfaces. Will not leave an oily film. Available as a concentrated liquid or as a ready-to-use solution in quart bottles. Extra Heavy Duty: Dilute ASSAULT with equal parts water. Rinse. 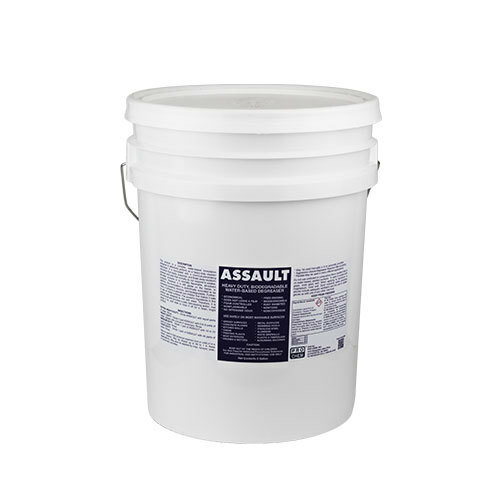 Heavy Duty: Dilute 1 part ASSAULT with 5 to 8 parts water. Agitate with brush if necessary. Rinse. Medium Duty: Dilute 1 part ASSAULT with 10 to 12 parts water. Rinse. Light Duty: Dilute 1 part ASSAULT with 40 parts water. Rinse. May be used in a high pressure washer (hot or cold) or in a steam cleaner. May be diluted up to 50 to 1 in these applications. May also be applied by mop, sprayer, soak, or automatic scrubber. Note: Not for use on Anodized Aluminum. Do not use undiluted on composition floors (resilient tile) or on water-based painted surfaces. Rinse well if in contact with glass, aluminum, and magnesium.